“He bought lunch today, so I think he’s going to have to do that again,” Benn said. Tampa Bay dominated early in overtime, with the first four shots on goal. But then Benn took the puck away in the Dallas end, bounced off a hit, passed to Cody Eakin and took a return drop pass before sending a shot past Lightning goalie Andrei Vasilevskiy for his 20th goal. Dallas goalie Kari Lehtonen held Tampa Bay scoreless for the final 34 minutes, with 15 of his 34 saves coming in the third period and overtime. The Stars won for the first time this season when trailing after two periods. They are 1-22-2 in those situations, and 3-9 in overtime. 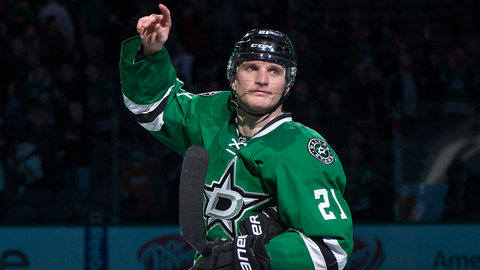 Roussel, popular in Dallas primarily because he leads the NHL with 115 penalty minutes, scored the team’s first three goals as the Stars came back from deficits of 2-0 and 3-2. His first two came six minutes apart in the first period, and his third tied the game 3-all at 4:40 of the third. Tyler Seguin assisted on all three of Roussel’s goals. Victor Hedman had two goals and an assist for Tampa Bay. Tyler Johnson added a goal and an assist. Dallas, last in the NHL in penalty killing, allowed goals on both Lightning power plays. Both teams are fighting to get into playoff position. The Lightning entered six points and six teams removed from the Eastern Conference’s second wild card. Dallas was seven points and three teams away from a postseason berth. Roussel’s first goal came off a backhand pass from Dan Hamhuis that Roussel redirected past Vasilevskiy, who finished with 24 saves. At 18:50 of the first period, Seguin passed from the slot to Roussel on the left. On Roussel’s third goal, Seguin passed from behind the goal line to his teammate in the middle of the left faceoff circle. Lightning: Travel to Colorado for the last of four straight road games on Sunday. This is the first of five back-to-back road games remaining on Tampa Bay’s schedule. Stars: After a five-day break for their bye week, they’ll play the second of five games in a row at home on Friday against Arizona.